Review: The Coldest War by Ian Tregillis – King of the Nerds!!! Ian Tregillis’ Bitter Seeds was one of if not my absolute favorite debut of 2010. After several major missteps by the publisher (well documented on the author’s blog) the second novel of the Milkweed Triptych, The Coldest War, is set for release later this year. In a bizarre experiment the decision was made to release the audiobook first via the fine folks at Audible.com. For those needing a refresher Bitter Seeds was an alternate history novel that rewrites World War II pitting the products of a Nazi super-science program against warlocks of Great Britain. The warlocks don’t simply toss spells around though. They must negotiate with omnipresent and dangerous entities who grant power in exchange for blood sacrifice. As the title implies The Coldest Wartakes place during the Cold War in the sixties; twenty-two years after the end of World War II. The protagonists of the previous novel have since moved on, for better or for worse. Former spy Raybould Marsh’s marriage is crumbling, strained by his simpleton son. Whereas former-warlock Will has put asside trafficking with devils in order forward his older brother’s philanthropic ways. Unfortunately for both the precognitive Gretel is active and at large and she, along with her brother Klaus, will some draw both these men back into the cutthroat world of Milkweed. I desperately want to say that I loved The Coldest War particularly given how eager I was to have it in my greedy little hands. While it by any means a bad novel it does have some problems; particularly with pacing. The first half of The Coldest War, as we are introduced to the mundane and somewhat sad worlds of both Will and Raybould, is where the novel is at its weakest. By my measure the novel suffers from this lack of the the strange and there is certain amount of frustration seeing a character like Raybould fallen so low. The Coldest War, at its outset, is definitely a slower burn than its predecessor and there is a significant amount of build up before things really get going. Getting to know Will, Raybould, Gretel, and Klaus again takes time, necessary time, but I would lying if there weren’t moments when I wished I could just skip ahead. Of the familiar faces reintroduced in The Coldest War perhaps my favorite was Klaus. For some reason his character arc between these two novels really stood out for me. A puppet of his Nazi masters in the first novel and constantly manipulated by Gretel here Tregillis really conveys Klaus’ frustration with his situation. Klaus’ desire to have a “normal” life is touching particularly when you realize that even he doesn’t quite realize what “normal” means; or even how to be normal. Klaus’ desire to get out of the business of spycraft and weird science directly contrasts Raybould’s near desperation to get back into the Milkweed program. Raybould is really a pitiable, bordering on loathsome, character in those early chapters and he spends more time wallowing than improving his situation. Will is still the insufferable British aristocrat borderline contemptuous of his peers yet still somehow blind to his own sense of entitlement. 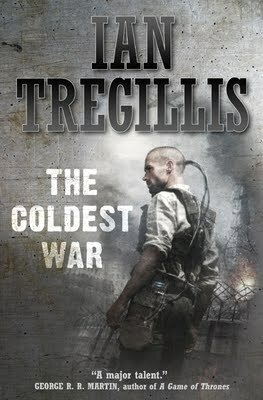 While both Will and Raybould are the novel’s protagonists Tregillis does not paint them in a consistently heroic light. Given what we know of how the British achieved their victory in the war this should not come as a surprise but it is nice to note the Tregillis continues to paint these characters in varying shades of gray. Despite the novel’s slow opening when things do pick up they really pick up. The Coldest War, despite taking place in a time of peace, features stakes that are arguably higher than in Bitter Seeds. Tregillis does an excellent job of capturing the paranoia of the Cold War era and paints the threat of Russian communism with a deft hand. More of the supernatural and weird elements are introduced in the novel as it progresses and once we are introduced to Britain’s new warlocks (glimpsed at the conclusion of Bitter Seeds) and witness some of the fallout from Raybould and Will’s past action things take on a delightfully creepy air. Gretel is as infuriatingly inscrutable as ever and the final revelation of her ultimate plan (or at least part of it) is pure genius. I have no idea how the next volume is going to play out. The Coldest War is a thrilling and sometimes chilling tale of spycraft, sorcery, and weird science. Its rocky opening offers a bit of an adjustment given how far our heroes have fallen but the pay off is eventually worth it. Like Bitter Seeds, The Coldest War is a novel that stands apart blending two typically disparate genres into a smooth unified whole. The Coldest War elaborates on many of the elements from Bitter Seeds taking the most mysterious aspects, Gretel and Eidolons, and adding new layers without destroying the mystery; that feat alone is well worth the price of mystery. Be warned The Coldest War has a cliffhanger ending and you will finish the book with the rabid desire for more. The audiobook version of The Coldest War is available now via Audible.com while the print version will be available on July 17, 2012.